Danielle, I'm glad to see that you are getting on well with your coloring. I ordered the entire 39 stamp pad set from sss. It was my b day gift from my dh. I am excited to have so many colors for stamping. Edited by andrea m on 03-09-15 12:26 PM. Reason for edit: No reason given. That is exciting, happy birthday to you!! Wow! That would be an awesome gift! That is so cool, have fun stamping! 39 options oh man! Happy birthday. Thanks ladies, i am excited. Now i just have to be patient for them to show up. sss is a slow shipping site . I cant wait thought to have more than a handful of colors to choose from. Show us some pics when you get them!! So we can sit and drool! lol! Cardmaking is taking second place these days. I have started some indoor planting for my vegetable garden. I hope to get some cards made this week though. But it's too nice outside to sit inside this week!! I will Kayla. I bought about 10 new stamp sets too. Now i just need some time to use them. I understand other things taking over. I have been so busy with work, life, and company. I need to make some time to get some b day cards done. Lisa did you know there is a fb group for the misti? Its call MISTIfied. Edited by andrea m on 03-11-15 09:14 AM. Reason for edit: No reason given. 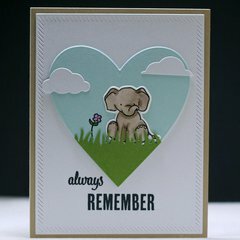 I like make cards get me something to do seen I don't have anything to scrapbook and I can't do much stuff outside yet. I am just make to many cards here. No I sure didn't Andrea. I'm going to have to check it out. I am loving mine more every day. Still working on that watercoloring too. It's starting to get a little easier so now I'm trying some small images. Nothing too detailed. Lisa your coloring looks wonderful. Love that little elephant. Thanks. I actually used Tim Holtz distress inks and water colored with a brush. I just can't get the hang of those pencils. Lol, I tried with the distress inks a couple of times after seeing Andrea's and didn't get it. I felt like I didn't have very much control. I bought more pencils. My mom got me a cricut today!!!!!! I just about jumped out of my skin when I saw it standing on the floor by my scrapping table!!!! Someone pinch me!!!! What a great surprise Kayla! Yay, good for you Kayla! Lots of fun ahead! Isn't that funny Amy? What works for one doesn't always work with the other. I felt I had more control over inks. I figured the elephant being one color would be a good beginners stamp. One of these days I'll have to attempt the watercoloring too! lol Amy i felt that same way when i was using the water color pencils. I feel like i have so much control with my distress inks. I think i was trying to use the pencils to much like i would the distress inks. I will keep practicing. Lisa I use my distress markers and reinkers on water color paper and I use a very small paint brush. I feel like i have more water control with the paint brush. Kayla how exciting and sweet of your mom. What an awesome surprise. I cant wait to see what you make. I really need to make a card today but i have a list of stuff to get done. My boss is gone this week so i have extra work everyday. I dont mind the work it just makes a busy day. how you use distress inks? yea that how I got my cameo my mom surprise me with it when I look at the door and there was a box. the best gift my mom bought me. Danielle it is hard to explain how to use the distress inks to color. I find it easier to watch someone. I watched tons of you tube videos. I could pause and watch over if i needed to. I've done the same Andrea. It definitely takes practice and not quite as easy as it looks. I have to keep reminding myself to build the color and not try to put it all on at once. The markers now come in the 49 set that includes all the colors except the ones being released this year. I actually prefer to color with my ink pads and re inkers. I have a tray that i have a dot of each re inker in. With the pads i just stamp it down on a clear stamp block or my mat on my crafting table. The markers dont blend as well to me. I tend to use them for fine detail or where i want the ink to stay dark. Lisa that took me awhile to get down. I also know a lot of water color paper will peel if you get to much water on it. I started with a water brush pen and it just stayed to wet. My favorite paper is hot pressed water color paper. It seems to be really hard to find. I found one large sheet that cost a fortune. I have found that it seems to be more of a UK thing. I have searched amazon but the brand they have is not even close to the same. I cant afford what other sites wanted for it. I have to maybe buy a few of the pen and try them out. I like the Strathmore mixed media paper that I've been using. It worked great with the watercoloring and Stamps stamp great on it. I also used it with distress paints and inks, getting it pretty wet several times and it held yup great. The only thing I don't like about it is that when you hold it to other white papers, it's not that white. I've tried the water brushes too and I also thought it was too much water. I have better control with just a regular paintbrush. I have some of that paper Amy it is my second favorite. I agree it is more of an off white color many of the water color papers I have purchased seem to be that way. The archers is satin smooth with no little bumps and a true white the hot pressed papers seem to be a lot smoother finish then the cold pressed. I even bought the water color paper by ranger/tim holtz. I really disliked that stuff. I blend colors a lot with the distress inks the water and the rubbing of the paint brush can tend to make the cheaper paper start to peel. Edited by andrea m on 03-12-15 06:07 PM. Reason for edit: No reason given. Danielle do you have any distress ink pads? If so take it and stamp it down on a clear stamp block. Use water and a brush to pick up the ink. Just try coloring a heart or something just to get an idea of how it works. I have found that the distress inks really need the water color paper. Lisa I used my misti today. I dont know how i lived with out it. I amazed at how perfectly i can line stuff up. Thanks so much for sharing it with us. Edited by andrea m on 03-12-15 06:13 PM. Reason for edit: No reason given. I just use a paintbrush too. I was wondering about the TH paper Andrea. Good to know it's not on your hot list. Lol Amy maybe its just me and i dont have a light enough touch. I thought for the price of the ranger paper it was nothing special i would rather buy the Strathmore. I also like to buy it in 5x 7 hot pressed sheets. Danielle you can still give it a try with the three. It might give you an idea if you like coloring with them. That's what I did. I started with a few distress colors and a paintbrush and just played around with them. Still playing. This also seems like the least expensive way to try. what kind of paint bush you use? do you use regular paper or some other kind? Spent all day at the scrap expo today. It was so fun! 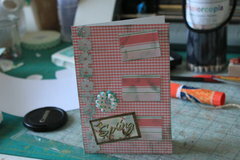 The card class was a little fast pace but I have the instruction and kits to finish at home. Did take another class and learned more about spray misting - love it. Stephanie glad you had so much fun. Good Morning! Is the weather as beautiful where you are as it is here...I absolutely love it. The weather was amazing yesterday. I work in an ice cream store that makes its own ice cream. I was so busy all day long. Today is overcast and dreary looking. Have you played with your cricut yet Kayla? Edited by andrea m on 03-14-15 11:03 AM. Reason for edit: No reason given. Glad you had fun, Stephanie! We had unusually beautiful weather this winter but the usual rain is back today. No Andrea I haven't. I tried to hook it up to the computer but I couldn't do it. Do I need a cartridge to get it to work for the Cricut Design Studio?? How much does it cost to open an account for the design studio? I would love to sit and talk with someone who knows about the cricut and to show me how the design studio works. Kayla what cricut do you have? look up cricut craft room not design studio you should be able to sign up and download the craft room. I do not use design space as i dont have an explore. with craft room you should get a couple free basic carts to get started. Otherwise you have to buy carts and link them. You can also purchase digital content. They also have tutorials you can watch under the help section. Once you have downloaded craft room you can use the long white cord to hook your cricut to your computer. It will them make you update and sinc your cricut. Here is what i got for my b day. I am a happy girl lol I still have two more stamp sets coming. Why is it that my wish list is still as long as ever. Edited by andrea m on 03-14-15 11:57 AM. Reason for edit: No reason given. well yesterday was nice weather here but today it is like andera weather. look like it might rain. I haven't been on because I was at a scrapbook class. Awesome Andrea!! Happy Birthday! I hope you get some time to play with it all soon. Lisa thanks I plan to. I made a card today and was able to stamp my sentiment in different colors. With the Misti my placement was perfect. Edited by andrea m on 03-14-15 07:23 PM. Reason for edit: No reason given. Ooooo look at all those colors, how fun!! Here is a b day card for my three year old niece. 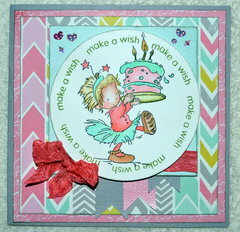 I stamped in a circle with the make a wish stamp using the misti. I then was able to line my lov stamp to fit perfectly in the circle. On the inside i used three stamps and my new inks. I made an ATC today. It only took me about four hours lol, I kept changing my mind. Beautiful Andrea! Amy what's an ATC? Artist trading card. They're 2.5" x 3.5". They're fun. I just make them like mini cards though, I don't get real artsy like a lot of people do. I just started last month when I decided to try the swap here. Amy it sure is funny how those little things can take so long. They are fun to make thought. Share a pic off yours i would love to see it. I have the Cricut Expression 1 but I thinking about returning it and getting the Cricut Expression 2. I think I did sign up for craft room! and I did try to use the white cord to hook my cricut to the computer but whenever I tried to do something with the craft room it says that my cricut isn't connected to the computer and I thought maybe I need a cartridge to hook it to the computer. No you dont. Go to the help section when it drops down click install drivers. It has to link to your cricut to be able to recognize it. then make sure you have the right machine and mat clicked on. I have the original expressions so that is all i can really help you with. It is a great machine. I don't have a mat that goes over the keypads. Is that also a problem? did you get a cartridge with your machine? If so older cartridges come with a mat inside. Newer cartridges do not. Cricut now sells universal overlay. It seems to be only a few bucks on line. No I didn't get a cartridge with my machine. Where do you get a mat for the newer cartridges? Will it not work without a mat? I am new at card making. I bought a Silhouette Cameo 4 weeks ago. I have been playing around making cupcake boxes and things like that. I wanted to make some Easter cards and the blade has broken or something. I posted a question in the die cutting machine forum on this issue. But I would like to post a question here. I have been looking at all the pretty cards people have made and am in Awe of the beauty of so many cards. I was wondering if any of the Silhouette users could tell me. Is there any way I can use the machine to make the "stitching look" around the edges. Kayla i saw the universal overlay online at j's. If you are using it all online you don't need an overlay. If you are using just cartridges you need an overlay. most older cartridges will come with one when you buy it. SkrappyKathy I am sorry i do not own a cameo so i can not help you. I have been looking online at stamps all day i just cant seem to own enough lol. I think I will be making another order at the end of the week. Thanks danielle. I shop around a lot. I buy them all online. Andrea, you should definitely get another birthday package. Have you seen the My Besties? I REALLY want some of those, I think they're so cute! There was another line, but I can't think of it to save my life right now. I am still waiting for my order to arrive, Gah! Almost half of them were preorders and I guess they haven't shipped yet (it did say late Feb, early Mar. Now it says March). I thought I could wait instead of doing two separate orders. I know better now lol. ScrappyKathy, I can't help you either. I hope you find an answer. Danielle, did you have fun at your class? I'll try again with the cricut. I don't know why I can't get it to hook up to the computer. Wow Danielle, that is super cute! You did do a lot. How long did that take? Amy who makes the my besties? Waiting for preorders is painful. I have a hard enough time waiting a week to get stuff lol. I am thankful for online ordering though. Without it i would not have anything. I am really trying to branch out and try some different stamps. I am thankful for this group and sharing different stamp companies. I really want some of the wild rose studio stamps. I ordered one yesterday but there are others i want. The little elephant bella is just adorable. Lol, yeah a week wait feels like eternity. Sherri Baldy is the artist of the My Besties. I found some of them online at J's. I had to look up the wild rose studio....eeeek! They're so cute! I agree, the elephant is adorable. I love elephants and kind of collect them (as in dust collectors, I only have 1 stamp). Them and snowmen. I have lots of snowman stamps though lol. I just bought a cute Easter stamp. can't Waite to get it . Edited by andrea m on 03-17-15 08:26 AM. Reason for edit: No reason given. Danielle where did you get your stamp? Danielle that is just an online store. They have wild rose studio dies but not stamps that i could find. I have never heard of them or shopped there. Edited by andrea m on 03-17-15 09:47 AM. Reason for edit: No reason given. That's it. You guys are too dangerous lol. Went to Danielle's link...Those Dreamerland Crafts stamps are really cute. Also, markerpop has a lot of stamps. Just be sure to continue through the pages. I think they have 125 different Wild Rose products listed. I just bought one stamp and if I like them I buy more later on. More watercoloring today with my distress inks. This one was a lot easier than I thought it would be. I still have to work on getting the hair shading but for the most part it's going smoothly. You guys are so good with your coloring! I'm not brave enough to even try lol. Stopping by to say hi. Andrea, my cards are getting better, more refined. I havent posted one in a long time. I am not up for the coloring, but I so admire you and your cards! Judy, is that you?!! Lol!! Lisa that card is adorable. your coloring is great. 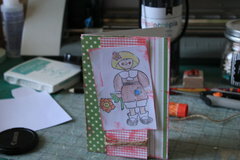 Donna i would love to see some of your cards, I am so glad you have been enjoying making them. Thanks for the info Judy. I had never heard of that site. I am always weary to order from sites that i have not heard people talk about. It looks like j's sold out of a ton of stuff they are having quite a sell. Danielle I hope you enjoy your stamp. I ordered four new stamps today. stephanie It took me awhile to decide to give it a try. My first few were terrible lol. Edited by andrea m on 03-17-15 05:52 PM. Reason for edit: No reason given. Danielle what stamp did you buy? It looks like j's sold out of a ton of stuff they are having quite a sell. I mainly started coming to this thread to learn stamping tricks, but I enjoy seeing all of the cards and coloring you all do. I make cards when I have to, but prefer LOs, although I'm not doing anything anymore except organizing all of my supplies. I've ordered twice from markerpop and everything went smoothly. It's been a while, so hopefully nothing has changed...unless it's even better! Judy, I am the same way: I started making cards to use up my scraps and because store bought cards cost a fortune. I am also too lazy to go buy them! Now, that I've made a few, I like it. But I am a scrapbooker at heart. Chatting away and I am falling behind! Andrea I think I could have gotten it to work but I decided to return it and buy to expression 2 from Hobby Lobby. I think it would be a better investment because it's a newer model and there are three cartridges with the package. But I am curious about one think and I want to know directly from someone who has experienced both .. what is the difference between a cricut expression 1 and 2. Is the two that much better than the 1 or is it just because it's a newer model. From what I gather, both of them are able to se cartridges and both are able to connect to cricut craft room. Kayla I really think it is just a newer model. I never bothered to upgrade because i did not see a reason. I don't own one though so i could not say if it some how works better or not. You might ask in the cricut forum. I am glad you got one that came with some cartridges. I only made los for years and just started really getting into stamping and coloring about 5 years ago. Now it is starting to take over. I like doing both though. If i am tired of one I can move to the other. The bonus is most supplies work for doing both. Edited by andrea m on 03-17-15 07:29 PM. Reason for edit: No reason given. I figure make cards seen they are so much at the store. so I figure I start make them. I still scrapbook. when I don't have anything to scrapbook I usually do some cards. I just start color and use some of my stamps I have. I am not great at it yet but hope to one day. I worked on coloring an image for a Easter card today. I only had a little time before and after work. I hope to finish it up tomorrow. I need to make four and am quickly running out of time. I did get the last two stamps i ordered as part of my b day package today. One is a huge falling snow background. I cant wait to try it on my Christmas cards. Thanks Judy I ended up buying four stamps from J's and a stamp scrubber. Edited by andrea m on 03-18-15 06:46 PM. Reason for edit: No reason given. I haven't even started on Easter cards yet Andrea. Spending this evening cleaning up the mess I created working on all those OWH cards. My scraproom is a disaster. Hopeing to get it all situated so I can whip up some cards for spring. Donna don't be shy. Post some of those cards so we can see.